The LEED rating system is designed to evaluate buildings, spaces, or neighborhoods, and all environmental impacts associated with those projects. Defining a reasonable LEED boundary ensures that project is accurately evaluated. The LEED project boundary must include all contiguous land that is associated with the project and supports its typical operations. This includes land altered as a result of construction and features used primarily by the project’s occupants, such as hardscape (parking and sidewalks), septic or stormwater treatment equipment, and landscaping. 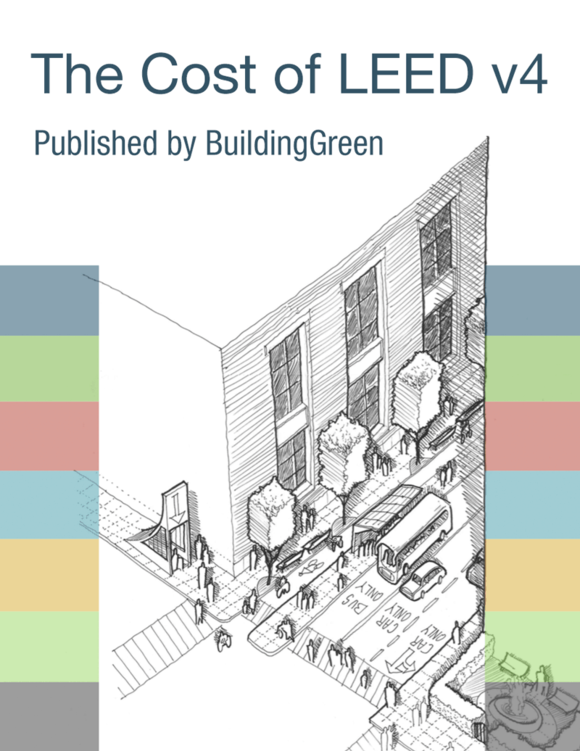 The LEED boundary may not unreasonably exclude portions of the building, space, or site to give the project an advantage in complying with credit requirements. The LEED project must accurately communicate the scope of the certifying project in all promotional and descriptive materials and distinguish it from any non-certifying space. Non-contiguous parcels of land may be included within the LEED project boundary if the parcels directly support or are associated with normal building operations of the LEED project and are accessible to the LEED project’s occupants. Facilities (such as parking lots, bicycle storage, shower/changing facilities, and/or on-site renewable energy) that are outside of the LEED project boundary may be included in certain prerequisites and credits if they directly serve the LEED project and are not double-counted for other LEED projects. The project team must also have permission to use these facilities. The LEED project boundary may include other buildings. If another building or structure within the LEED project boundary is ineligible for LEED certification, it may be either included or not included in the certification of the LEED project. If another building within the LEED project boundary is eligible for LEED certification, it may be either included or not included in the certification. If included, the project must be registered as a group certification project and the LEED campus certification process must be used. Sites with a master plan for multiple buildings and/or phased development must designate a LEED project boundary for each individual project. The gross floor area of the LEED project should be no less than 2% of the gross land area within the LEED project boundary. A LEED campus boundary for the master site must also be defined if campus credits are being pursued with LEED campus certification. The LEED project boundaries for each project registered under the master site must be wholly contained within the LEED campus boundary. All site features and amenities (existing development, new development, and future known development) within the LEED campus boundary must be included in the scope of the campus credit. The LEED project should include the entire building and complete scope of work. Buildings or structures primarily dedicated to parking are not eligible for LEED certification. Parking that serves an eligible LEED project should be included in the certification. Buildings that are physically connected by programmable space are considered one building for LEED purposes unless they are physically distinct and have distinct identities as separate buildings or if they are a newly constructed addition. If separated, the projects should also have separate air distribution systems and water and energy meters (including thermal energy meters). Primary and secondary school projects, hospitals (general medical and surgical), hotels, resorts, and resort properties, as defined by ENERGY STAR building rating purposes, may include more than one physically distinct building in a single LEED project. For new construction projects, each building in the application must be less than 25,000 sq. ft. Please contact USGBC if with any questions. For other cases such as buildings that have programmatic dependency (spaces – not personnel – within the building cannot function independently without the other building) or architectural cohesiveness (the building was designed to appear as one building), project teams are encouraged to contact USGBC to discuss their project prior to proceeding. The LEED project should be defined by a clear boundary such that the LEED project is physically distinct from other interior spaces within the building. The LEED neighborhood includes the land, water, and construction within the LEED project boundary. The LEED boundary is usually defined by the platted property line of the project, including all land and water within it. Projects located on publicly owned campuses that do not have internal property lines must delineate a sphere-of-influence line to be used instead. Projects may have enclaves of non-project properties that are not subject to the rating system, but cannot exceed 2% of the total project area and cannot be described as certified. Projects must not contain non-contiguous parcels, but parcels can be separated by public rights-of-way. The project developer, which can include several property owners, should control a majority of the buildable land within the boundary, but does not have to control the entire area.